Should a woody plant that looks dead after a severe winter be removed? Blog / General Gardening / Should I remove a shrub that looks dead, a victim of the winter of 2013-14 ? Should I remove a shrub that looks dead, a victim of the winter of 2013-14 ? I think the time has come to modify that recommendation in some situations. One is where the plant is showing new growth in some areas, but many branches do not. You scratch the surface with your thumbnail and no green cambium is visible. Twigs snap easily. Step back and take a good look at that tree or shrub. Imagine what it will look like if the “dead” wood is removed. Will the shape of the remaining structure be acceptable? Is there a likelihood that the “live” branches will fill in and eventually heal the negative effect on your landscape? If the answer is a very positive “Yes!”, I’d say go ahead and remove the bad wood. Give the new growth space to develop. Keep your fingers crossed. If “No”, it may be time to remove the plant. The other situation where I’d say “Take it out!” is when the plant never should have been put there in the first place. It’s right next to a heat pump or an air conditioning condenser where it gets blasts of hot air year round. Or it blocks the view as you back your car into the street. Or it’s underneath the living room window and you’ve had to cut it back every other year. Take it out! Remove it and if you feel a need to replace it choose something more appropriate for that site. But choose one which will survive on the nutrients, moisture, pH and sun provided by the desired placement. 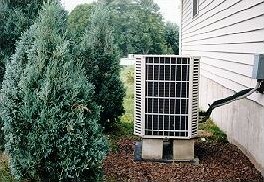 NOTE: Landscaping around a heat pump or air conditioning condenser might be used to provide summer shade from a deciduous tree or to conceal the machinery. In any case allow at least five feet for air circulation around the unit for air flow and service access.